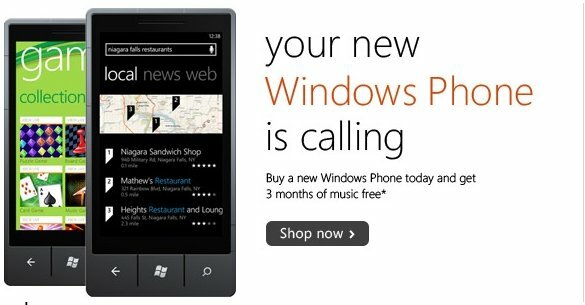 Today’s launch of the new Windows Phone 7 devices seems to gone a bit under the radar. I was expecting a big advertising push from Microsoft today. But so far no parade and no Microsoft blimp overhead, I think the bigger news is unexpected price cut at some big retailers. Amazon Wireless and Dell Mobility are both selling various Windows 7 phones at substantially lower price than the expected $199 2-year deal. Looks like Amazon has the best deal so far. They are selling the HTC Surround and LG Quantum, both on AT&T, for low $99 with 2-year contract and data plan. Dell Mobility has all four of their phones listed at $149. They even have the T-Mobile HTC HD7 listed at $149! There are quite a few places to check if you are interested in getting a new Windows Phone 7 device today, so make sure you shop around. It’s clear all of Microsoft’s eggs are in one basket with the launch of Windows Phone 7. The Redmond based company can’t afford to fail, this is their one chance of getting back on top of the mobile market, so I wouldn’t be surprised if they pull out all the stops with this launch over the next week or so. So far I haven’t heard anyone or anyplace being swamped or sold out yet, unlike in parts of Europe. We reported last week that new Windows devices were flying off the shelves in the UK. It’s still early here in the states, and there are a lot places to get a new Windows phone, so I guess I wouldn’t expect long lines like the iPhone gets. One big thing Microsoft is doing to celebrate the launch, is they’re putting on two free concerts tonight. If your lucky you can see either Katy Perry in NYC, or Maroon 5 in San Fransisco. You can check out Microsoft’s Windows Phone Facebook page for more details on how to score tickets. If any of our readers are deciding on getting a new Windows Phone, please drop us a comment and tell us what you think! 4 Responses to Windows Phone 7 Launched Today in the U.S.
Next Entry: Will iOS 4.2 speed up iPhone 3G?